Empower your home and enrich your life. Quite simply, our home automation solutions give your dream home previously unimagined capabilities. With a touch control over your home's lighting, climate, shades, entertainment, security, and much more, you can wake-up every morning to a home that is ready for you. Open the curtains, disarm the alarm, play your favorite song then step out of bed. Quality craftsmanship and a timeless look complemented by a home automation system that can evolve as technology changes will be a hallmark of your home. A home automation system that can evolve with technology and change with your needs begins with a wiring plan. Wiring for the future will not only keep your options open, but also save you money. 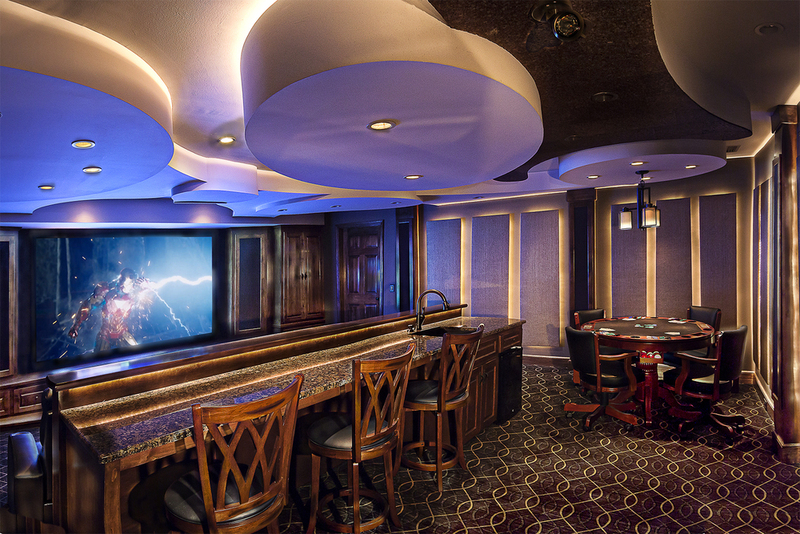 We will work with you to develop a fully engineered wiring plan that takes into account your future home's security, entertainment, motorized shades, lighting, and networking needs. Already have a Smart Home, Home Theater, Security System, or other problematic set of electronics? Don't worry, you are not alone. We are always taking calls and making repairs on systems that we didn't sell. We pride ourselves on succeeding where others have failed. Relaxation begins the moment you step foot into your new smart home. Entering, you press one button. The lights dim, shades lower, music plays, and the fire place lights up. All that is left for you to do is relax. Set the mood with our intelligent lighting control. The effect that light has on a room's design and ultimate ambience cannot be overstated. Automated control over both your home's lighting and motorized shades gives you the ability to transform the look and feel of a room based upon the time of day or even your mood. A bright and airy room by day can be transformed into a dramatically lit, yet inviting space by night. In our home theaters you don't just watch movies, you experience them. Feel every explosion from your favorite action movie reverberate through you. Linger on every note from your favorite concert. Savor every moment of family movie night. After the movie finishes, the curtains close and the lights come on, but the feeling remains. We pair our technology with your taste to give you an immersive cinema experience that is uniquely your own. Whether the design of your theater complements the design of the rest of your home or stands in contrast, we will give you a theater that will awe you and your guests. We give you multi-room audio, but what you really get are more places to dance. Your favorite song is on and no one is watching. As you move from room to room, you are enveloped in rich, room-filling sound. Don't fight it. One foot starts tapping, then the other. You start to sway. Next you begin to sing the chorus, followed up by the best part, your air guitar solo. Have a concert moment every day with our whole home audio system. Unobtrusive speakers blend seamlessly into your ceilings. Simple, easy to use interface, makes choosing a song a breeze. Music from your favorite sources such as Pandora, SiriusXM satellite radio, Spotify, and your iTunes music library. Technology as unique as you are. Your home is a reflection of you. Your influence can be felt in every room. The flooring, the wall colors, and even the cabinet hardware all create a style that is unapologetically your own. So why settle for a smart home that doesn't fit you. At ENCO we have the engineering expertise to tailor your smart home to fit the needs, wishes, and desires of you and your family. Your lifestyle may demand more from your smart home than control over the lighting, climate, shades, entertainment, and security. Want to turn your hot tub on from your phone as you leave work? No problem. Want a text alert the moment your home's generator begins to run? You got it. Want to know how much time your pet sitter actually spent with your pets. Certainly. Whatever it takes for your smart home to simplify and enrich your lifestyle we stand ready to provide. From the moment you break ground, you begin filling your home with memories. Upon completion, your home begins to fill with family heirlooms. Pictures of your home's first Thanksgiving, your grandfather's watch, or your child's first macaroni art picture that reads "I love you mommy" are all priceless pieces of family nostalgia that are preserved within your home. We at ENCO know this. That's why we have developed a complete security system to protect the things that matter most. 24/7 monitoring with cell backup. Receive text alerts the moment trouble is detected, even if it is just a slight temperature change in the wine cellar.